A Magical Match is book 9 in A Witchcraft Mystery series. I kind of just hopped right into the series with this book but didn't have any issues following the plot. I was a bit intrigued by some of the characters backstories probably told in the previous books so I went ahead and grabbed book 1 so I can actually read these in order next. If you couldn't tell by the title this is a mystery book with paranormal mixed in! I'm loving this genre and going to have to try a ton of them in the near future. Lily Ivory is a witch that runs a vintage clothing store. She's busy with her coven planning a brunch that will be held at her store and everyone is trying to help out with the plans. Everything seems to be going well until a man turns up dead and Lily's fiance Sailor winds up in jail as the lead suspect. Things take a crazy turn when Lily spots a man walking around and it looks exactly like Sailor. Lily is on the case trying to figure out who the doppelganger is and who really committed the murder. All of this is going on while organizing the brunch and trying to make plans for her upcoming wedding. Add in a shape shifting pig/gargoyle familiar and it's a must read. 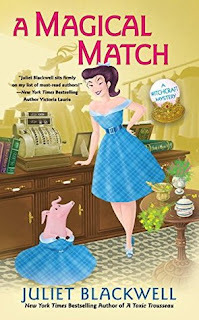 A Magical Match is a binge worthy series you don't want to miss. I've grabbed book 1 and plan on knocking out these books since I was so entertained by this installment. Though I do think I'll be trying these in audiobook format since I'm preferring those lately. The characters were interesting and it had enough whodunit to keep me intrigued throughout the book. I can't wait to see what the rest of the series holds. All in all, if you're a fan of paranormal + mystery you need to try these books.